It’s always great to discover new Canadian cheeses. A few months ago I stumbled on a terrific cheese from Ontario that I hadn’t tried before. That’s not to say that it has only been available for a short time; it’s more a case of “new to me” rather than new to market. There’s so much going on in the Canadian cheese world that sometimes it’s hard to keep up! 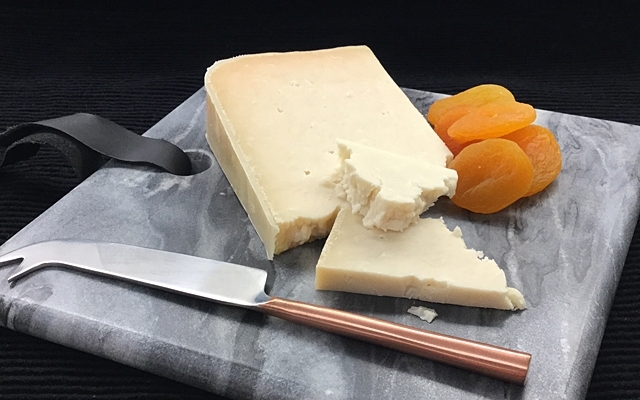 Lindsay Bandaged Goat Cheddar is a clothbound goat cheddar made by Mariposa Dairy on their 100-acre farm near Lindsay, Ontario. The cheese is wrapped in cloth by hand before being place on pine boards in aging rooms where it rests for at least one year. The cloth wrapped cheddars are turned once a week to ensure even aging and brushed by hand when needed, until they have reached their ideal maturity. The first thing you notice when you cut into a piece of Lindsay is the beautiful texture. When your knife hits it, the cheese sort of cuts and crumbles at the same time, as the paste is a little brittle. You can tell just by looking at it that it is aged perfectly to give the cheese the right balance of moisture and that lovely crumbly cheddar appearance. These qualities carry through to the tasting as well. The flavour starts out on the front of the palate with rich, almost butterscotch-like sweetness. The sweetness is followed by a nice tangy bite that hits the back of your jaw and lingers before a lightly fruity finish, surely a testament to high quality milk and great cheese making skills. This beautiful cheese is just one indication of how seriously this Ontario farming family takes their work. Sharon and Bruce Vandenberg started this cheese making adventure in 1987, with only a small number of goats. Today they have grown so much that they have over 1200 milking animals. All of the milk they use comes from either their herd, or from like-minded farmers in their region. They have introduced innovative systems to track the health of their animals which is so important, as everyone knows healthy and happy goats give delicious milk! After introducing this cheese in our showcase this winter, we’ve noticed that people can’t seem to get enough of it. It really is the hit of this season, and I have even converted some non-goat lovers to this new Ontario classic. Lindsay Bandaged Goat Cheddar is just one more reason to keep your eye on our Canadian cheese makers. les amis du FROMAGE is a family owned and operated specialty cheese store with two locations in Vancouver. With a carefully curated selection of local and imported cheeses, charcuterie and accompaniments, they also specialize in frozen soups and meals, all made in house using top quality ingredients. Founded in 1985 by the mother and daughter team of Alice and Allison Spurrell, les amis du FROMAGE is proud to still remain a family owned and operated Vancouver company after over 30 years in business. Current owners Allison Spurrell and Joe Chaput have come a long way since the original shoe-box sized store opened in Vancouver’s Point Grey neighborhood. You can rest assured that their mission is to continue the company’s reputation of offering the highest quality cheeses, cut to order, along with one-to-one customer service. Vancouver - 1752 West 2nd Avenue, BC V6J H6 Tel (604) 732-4218; Strathcona 843 East Hastings Street.V6A 1R8 Tel 604-253-4218. www.buycheese.com.